Now 25 years old (! ), A Fish Called Wanda is a classic comedy, though perhaps not as much as its initial success might have suggested it would be. Still, it’s hardly aged at all in the passage of time since its release, with the exception of the occasional Jamie Lee Curtis fashion accessory. Mixing sight gags, situational comedy, character quirks, black humour, and biting verbal jokes masterfully, the script by John Cleese and director Charles Crichton has been rightly praised as a model of the form (and was nominated for the Best Original Screenplay Oscar). It starts (and mostly ends) as a heist movie, but corkscrews away from that into courtroom drama send-ups and social comedy-of-manners material along the way. It is never bound by its plot requirements, though, and feels secure enough in its own comic vision to indulge in fruitful and hilarious tangents, like many fine comedies do. But all of the strength of the writing would mean little without the superb comic performances that bring this exquisite farce to life. Curtis vamps it up as the wheel-turning seductress, Kevine Kline chews every bit of scenery in his dandified path, and Michael Palin (always the most versatile performer of the Monty Python troupe) turns in a committed oddball role of little vanity. But it’s Cleese’s Archie Leach that is the battered soul of the film, a beaten-down, emasculated, lonely man who is torn between delight and depression at the spectacle of his well-built and proper life unraveling completely before his eyes. Kline got the Oscar, but Cleese’s less showy turn wins on points. Everyone has a favourite scene (and it’s usually the goofy faux-torture between Kline and the stuttering Palin involving the latter’s prize goldfish), but mine is the climactic encounter of the two Python alums. The expected reunion is held back, and the result is a pure, silly laugh riot. As is the case with A Fish Called Wanda in general, which emerges even a quarter-century later as one of the great film comedies of recent memory. The Back to the Future films were always marvels of production design and cool tech effects in their own time, but in Part the Second, there’s not much else beyond those technical factors to entertain more deeply. The endless winking references to the first film’s events wear thin and possess little of its sly, inventive wit, and though the returning cast falls into their broadly-drawn characters easily enough, their engagement in the proceedings seems minimal. Furthermore, the plot is frantic and episodic, leapfrogging from one time period to another alternate universe in a way that feels almost casual. As with many effects-laden sequels that try to one-up their more homespun predecessors, Part 2 lacks the iconic simplicity of Part 1′s memorable images. When some of them are replayed for us in the last act, we are directly reminded of this. The Hill Valley of the future is shiny and weird and cool and impressive, but it bombards you with baubles instead of winning you over with wonders, as the first film did. The clumsiness of the plot doesn’t help, either; many narrative strands are introduced and then not concluded or even advanced at all. If you want to see a beautifully-constructed time-travel plot whose subtle paradoxes are delightful grace notes, skip this tangled mess and give the elegant, beguiling last act of Alfonso Cuaron’s Harry Potter and the Prisoner of Azkaban another view. That, right there, is how you do it. As a side note of interest to me and probably to absolutely no one else, Part 2 also has less to offer us as a reflection of the social anxieties of its time than Part 1 did. Aptly, a film so full of time-hopping is not terribly focused on its own era. The dark alternate future of “Hell Valley”, a near-post-apocalyptic wasteland overrun with predatory gangs, firearms and crime, is too contextless to constitute much more than a hyperbolic nightmare vision of the worst policy consequences of the Reagan-Bush I presidential dynasty. Biff Tannen becomes a hyper-wealthy robber baron, and so unravels the entire social fabric? We’re all for quasi-marxist readings of class struggle and the destabilizing rapine of capitalism around these parts, but Back to the Future II provides the conclusion without the premises. Any prospective commentary in the 2015 sequence, furthermore, dissolves into innocuous, knowing in-jokes. All in all, this film bit of a slapdash rehash, but at least it ably set up a genuinely entertaining trilogy conclusion. 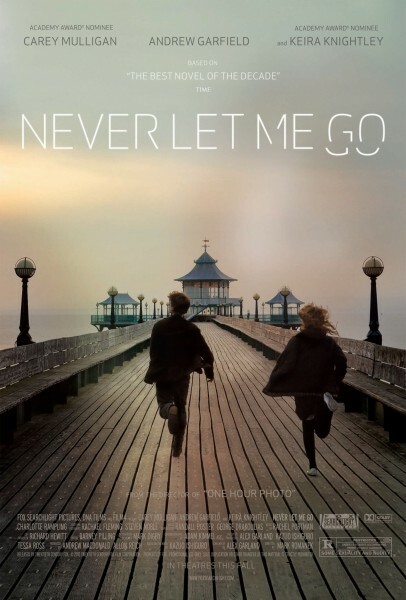 Tenderly adapted from Kazuo Ishiguro’s Booker-shortlisted novel, Never Let Me Go takes onscreen form as a wrenching low-key elegy for youth, love, mortality, and widely-accepted conceptions of the value of human life. Shot in a drained palette of greys, browns, and faded greens, long-promising director Mark Romanek’s most accomplished feature effort imagines an alternate social history of post-war Britain that couches the common sci-fi theme of human cloning in the familiar literary environs of the boarding-school bildungsroman and the tragic, understated romance. And though it adapts and repurposes Ishiguro’s themes into a cinematic vision that is both more concrete and tangible as well as more spare and poetic than his novel, it vitally refuses to relinquish the implications of those themes for more comforting and palatable iterations that might have lain within easy reach. The central trio of characters in this story are introduced to us as children attending an austere, pastoral English country boarding school called Hailsham. Kathy H (Isobel Meikle-Small) is a quiet, thoughtful, sympathetic girl who is bosom buddies with the slightly more impulsive and easily-led Ruth (Ella Purnell). They both gravitate towards the awkward Tommy (Charlie Rowe), Kathy as an empathetic presence to lead him out of the shell he retreats into when teased by classmates, and Ruth as an eventual physical lover. Hailsham has a big secret, though, and it’s revealed to the children by the seditious teacher Miss Lucy (Sally Hawkins) before she is unceremoniously removed for violating the expected discourse of the school. The children of Hailsham are indeed “special”, as the headmistress (Charlotte Rampling) is fond of telling them. They are clones being groomed with the expressed purpose to be organ donors in young adulthood, kept sheltered and healthy so that their bodies’ bounty can be harvested and transplanted into the bodies of the rest of the population to keep it disease-free and long-lived. The elaborate educational structure of Hailsham, including lessons, sports, toy-markets, and an art competition to contribute to a mysterious gallery, constitutes velvet-glove indoctrination, per Miss Lucy. It’s a prison whose chains are forged of lace, a muslin lie to overlay an illusion of comfort, achievement, and structured milestones onto the essentially empty existences of human organ farms (a sharp critique of do-gooding liberal uplift lurks just beneath the surface, though the bleeding-heart tendencies are soon revealed to be more laudable than they might initially appear). If Lucy’s revelations sink in at all, it doesn’t show in the actions of the adult versions of the trio. In a post-school commune called the Cottages, Ruth (adult iteration played by Keira Knightley) and Tommy (Andrew Garfield) carry on a noisy sexual relationship that Kathy (Carey Mulligan) is forced to endure. She nurtures a purer romantic affection for Tommy and a saint-like fondness for Ruth, and projects her desire for tenderness onto her chosen profession of a carer, a psychological and emotional support worker who shepherds her fellows through the pain and isolation of their donations until “completion” (ie. death). She grows closer to both Ruth and especially Tommy after the conflicts of their younger years, especially when the possibility of a romance-related deferment of the donation process (connected to that mysterious art gallery) presents itself as a fleeting promise of reprieve. Romanek’s adaptation of Ishiguro’s suggestively sketched alternate universe often makes explicit what was merely implied on the page (dates are given, setting the events through the 1970s, 1980s, and early 1990s). But he puts heartening artistic faith in symbolic images to convey the text’s invocations of the ephemerality of existence: a bird perched on the handle of a teapot, a beached fishing boat, debris snagged on barbed wire fencing and fluttering fruitlessly in the wind (Adam Kimmel’s cinematography is all the more superb for the film’s drab colour-scale). His young cast are on the same wavelength, wordlessly conveying the weight of their approaching pre-ordained fates with sublime skill (as does his younger cast, who eerily resemble the better-known actors portraying their older selves). Knightley’s natural chin-jutting defiance bursts out in the petulant Ruth, whose relationship with Tommy is more about denying Kathy his company than gaining it for herself, and the guilt she feels over her actions in her waning, post-donation days is palpable. Garfield, now known more for confident swagger in The Social Network and as the new Spider-man, is sheer gangly hesitation, but with a steely survival instinct that Kathy’s return to his life activates. And Mulligan, wasted recently as a breathy Daisy Buchanan in a gawdy Gatsby, is riveting as both a performer and a narrator, the glowing soul of this fully-felt film. In animating Ishiguro’s painful and moving narrative with such technical and aesthetic skill, however, Romanek leaves its thematic core more exposed. The nagging question at the centre of Never Let Me Go is never quite satisfactorily answered: why don’t the donors who want more time, more of a life for themselves, make an escape? Romanek doesn’t let us miss the mechanisms of electronic monitoring and control at both Hailsham and the Cottages: the donors swipe electronic bracelets when entering both the school and the safehouse, and CCTV cameras peer from the corners of many shots. But what wins out is Ishiguro’s more metaphoric suggestion that obedience to official institutions and an amorphous sense of duty compel these characters to accept a life-path that would spark rebellion in freer spirits. As a Japanese-born citizen of Britain, Ishiguro has particular experience of two cultural contexts in which stiff-lipped acceptance of rigid conditions is a matter of honour in closed-mentality island societies, even if (especially if) that acceptance is a precondition of misery (the lonely butler narrator of Ishiguro’s defining work The Remains of the Day embodies this state of mind). One can only imagine that American donors would make a run for it, the reaction of a more restless people in an unending pursuit of happiness. Never Let Me Go is a deeply beautiful and finally moving piece of work, despite such quibbles. Its closing message equates the brief lives of the donors to the all-too-quick passage of our own days, and urges appreciation of the small fortunes of our experiences rather than lingering regret at what was missed out on. Romanek’s affecting film visualizes Ishiguro’s imaginative fable in the terms of another great English man of letters, the Venerable Bede. Human lives, as Bede puts it, are as the “swift flight of the sparrow” through a warm hall in winter time. Ishiguro’s Never Let Me Go sketches a belief that we can only appreciate the warmth and light of this swift flight as we prepare to emerge again into the cold darkness, and Romanek’s film renders this sketch tenderly tangible. Further suggestions for maximing appreciation of the realms of hashtags and RTs. Past recommendations: #1, #2, #3, #4. @Sidslang can be tracked here. So much of the public discourse concerning Twitter prefigures it as some sort of unprecedented new style of communication, but it has its clear precedents. I previously discussed the epistolary storytelling lineage of brilliant Oilers-centric parody of @SHorcov, but @SamuelPepys makes a much more obvious connection in the history of letters. Pepys was an English naval administrator of the Restoration era best-know for the detailed and amusing daily diary he kept as a young man in the 1660s, one of the key sources for information about life in the period and an inadvertent classic of literature. The Twitter feed is connected to a blog run by Phil Gyford that posts a full entry of Pepys’ diary every day, and briefer snatches of it find their way into tweets. Though the content is not original, its use in the Twitter medium shows us how little has really changed in the chronicling of daily activities through written word in 350 years. Just as the lion’s share of tweets by most users of the platform from celebrities to regular folks surely concern what they’re doing, where they’re going, and who they’re doing it with, Pepys’ feed transposes his similar diaristic recording of quotidian comings and goings to the fresh medium. In this way, the distinctions of centuries of social and cultural history can vanish in under 140 characters. The King did not come and the poor people were forced to stand in the rain. Afterward he touched them in the Banquetting-house. It cannot be said that Skyfall does not make itself very clear. In the middle section of the latest instalment of the long-running James Bond franchise, 007 (Daniel Craig) races against time through the London Underground to prevent a threat to the life of his boss, an unaware M (Judi Dench). As the danger approaches and the tension ratchets ever higher, M stands up to the doubtful questioning of a parliamentary inquiry into MI6, which has suffered a deadly terrorist strike to its headquarters on the Thames and had many of its undercover agents exposed and killed. Backed up against a figurative wall and forced to defend her agency’s role in a changing world as well as the considerable public funding that keeps its intelligence operations running, the indomitable M has a ready answer. She tells the MPs that Britain’s enemies are unseen, stateless, and dwell in the shadows, and so MI6 must follow them into the shadows and do battle with them on their own terms to protect the freedom of the British citizenry. Like the loyal subaltern of the powerful national security state that she is, M makes a naked appeal to ignorance, fear, paranoia, and above all to her own institutional authority. It’s at once stubbornly old-fashioned and terribly modern. And so is Skyfall, a Bond film highly cognizant of the painful friction between a fast-receding glorious past and an uncertain, unfamiliar future, especially for the country 007 has served for so long. As the high-profile Bond release of Great Britain’s Olympic year (following hard on the heels of the iconic spy’s appearance with the Queen and her freakin’ corgis during the Opening Ceremonies of the Games, for pete’s sake), Skyfall is probably the most overtly nationalistic Bond movie ever. Though it begins with a dynamic action sequence through the streets and across the rooftops of Istanbul and proceeds through exotic locales like Shanghai and Macau, the film is punctuated by icons of Britishness. The Underground, the National Gallery, Westminster, the mysterious Scottish Highlands, and a spooky stone manor house on the gothic moors are among the settings for its narrative. Its denouement even features a golden-lit rooftop view across at the landmarks of Whitehall and the City, copious rippling Union Jacks caught by the westering sun. Subtle, it ain’t. The lack of subtlety can be a bit of an issue, now and again. One doesn’t necessarily expect juicy political or social metaphors from the Bond-verse, but director Sam Mendes (working from a script by Neal Purvis, Robert Wade, and John Logan) provides a few such elegantly-drawn analogies only to sledgehammer them into easily-digestible bits for mass audience consumption. Bond’s first meeting with his new Quartermaster, or Q (Ben Whishaw), takes place in the National Gallery in front of J.M.W. Turner’s The Fighting Temeraire, depicting the venerable warship, veteran of the Battle of Trafalgar, being towed to berth to be scrapped. A similar theme has already been introduced as concerns James Bond himself, who is established as being not quite as physically hale and hearty as he once was as well as maintaining and representing an outmoded hands-on mentality in a highly technological age. But rather than trusting audiences to catch this reference to a defining tension of modern Britain, Mendes has Q make the kinship between the Temeraire and Bond painfully explicit, with the youthful techie and the aging field agent as opposing stand-ins for the new and the old. This dichotomy is further reinforced by another such heavy-handed metaphor, this time in the requisite talking-villain encounter with Bond’s antagonist, Silva (Javier Bardem). Silva, a former MI6 agent who felt betrayed by M and has transmuted the physical, mental, and ideological scars that resulted into an implacable sense of vengeance, paints an exquisite psychological analogy for the captive Bond. He tells of how an infestation of rats on an island he visited with his grandmother in his youth would reduce their coconut stocks. To solve the problem, they captured all of the rats and gave them no food, so that they ate only each other until just two animals remained, which were then released with no taste for coconut, only for rat. Again, Silva obviously refers to himself and to Bond, forged into pitiless robots of infiltration and murder by their mutual grandmother figure M, but the implication is again not allowed to function without an extra push and a later call-back. Silva’s story is not quite like that of any disgruntled ex-agent Bond villain (and there have been a few). Indeed, indiscriminate terrorist killings aside, his crusade could perhaps even be understood as a righteous one, a ruthless quest to bring the ruthlessness of M’s secretive government agency out of the shadows and expose it to the light of public consciousness (his bleached hair immediately suggests WikiLeaks founder Julian Assange). Bond doesn’t understand it that way, of course. He is ever the paean to British fortitude as expressed through faith in its venerable, stony-faced institutions (represented as well by Dench’s forbidding M, and by a heavy-handed bulldog paperweight on her desk, emblazoned with the Union Jack). But, particularly in his Daniel Craig manifestation, Bond is also vitally the avatar of the morally-compromised covert operations that maintain the world’s oldest parliamentary democracy, the ambiguous shadow-play that allows the lights to keep shining brightly (if disingenuously) across persistent Albion. All of this figurative talk of light and shadow begs for a segue into discussing Skyfall‘s most genuine cinematic triumph: the cinematography of Roger Deakins. The masterful veteran of astounding filmic photography (he shot the Coens’ late-’90s classics like Fargo and The Big Lebowski) achieves his trademarked visual richness throughout Skyfall, but a few sequences are jaw-dropping stand-outs. The climactic last stand of Bond and M at that old mansion on the moors (boobytrapped against enemy incursion like an adult version of Home Alone) is smothered in earthy greys and browns, the inevitable fiery explosions backlighting the proceedings with a warm glow. Bond’s arrival at a casino in Macau is lit by crimson oriental lanterns reflecting off of golden carved dragons. Most astonishing is Bond’s stealth pursuit of an assassin to the upper floor of a Shanghai skyscraper at night, as the nocturnal urban darkness is broken by an adjacent blue neon advertisement of a swimming jellyfish, its tentacles stringing uncanny light across the frame. 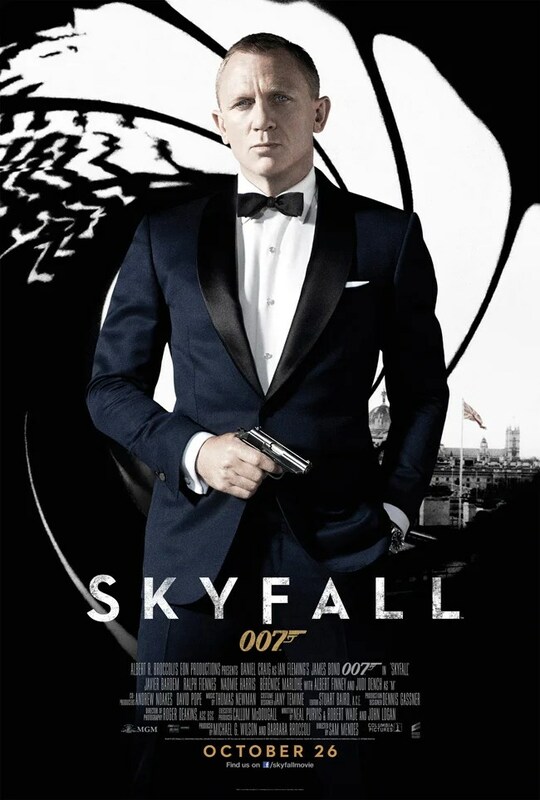 As amazing as it looks, though, Skyfall is hurt by its stubborn insistence on hewing to middlebrow convention. Even Mendes’ attempts to twist the Bond mythos into fresh directions come across as half-measures. The return of Moneypenny (Naomie Harris) sees the prim object of low-key traditional office femininity step down to that role from that of a badass in the field, while the Bond Girl proper (Bérénice Marlohe) is a perfunctory presence who vanishes from the plot after accomplishing her specific purpose. Most buzz-worthy was Silva’s homosexual come-on to 007 in the place usually appointed to a sequence of confinement and torture. Bond’s reply that he had more experience of that sort than his antagonist might think is such a transparent bluff that it defuses the implied orientation of the villain as well; the button-pushing moment comes to nothing, leaving us to wonder why precisely it’s there. Maybe these complaints are tantamount to nitpicking and over-intellectualizing. Skyfall is rather entertaining product, for the most part. But the implications of M’s defence of her agency and, by extension, of the Bond franchise are redolent of an authoritarian sentiment that creeps into the film like a deadly chemical fog. The willingness to be open to moral hazard is mistaken for political seriousness; privacy is only protected by pervasive surveillance, the transgression of individual freedom is the only thing that can preserve it. And we must not only create and unleash clandestine monsters like Bond to neutralize the monsters we cannot see, but we must also immortalize them and their deeds as reflective of an essential popular heroism. When Bond finishes off the crusading Silva, it’s with a knife in the back (and come on, now; don’t act like that’s a spoiler of any stripe). Skyfall completes (or at least continues) a three-film arc that has embraced the anti-heroic qualities of one of the movies’ iconic heroic figures. But it’s a problematic reminder that rendering all of our heroes as antiheroes prefigures their anti-heroic ideologies as fundamentally heroic, despite their moral lapses, and that Bond’s ideology was always inherently morally lapsed in the first place. Never having been a big fan of the Bond films under any on-screen steward but still somehow having seen many of them, watching Casino Royale was a purposeful attempt to forge a new viewing relationship with the venerable, lucrative franchise. My Bond skepticism tended to be related back not only to their flashy, gut-punching shallowness, old-fashioned chauvinism, or quasi-fascist privileging of masculinized violence as not only a means to an end but an end in itself. My profound Bond doubts were also grounded in structural filmmaking concerns, as the narrative progression of most franchise installments (especially to the noisy and increasingly uninspired Pierce Brosnan entries to which Casino Royale is intended as a riposte) tended to feel like little more than expensively ticking off items on a checklist. Pre-credits action sequence: check. Maurice Binder design homage in the opening credits: check. Get gadgets from Q: check. Flirt with Eve Moneypenny: check. Approach interaction with M with mixture of deference and insolence: check. Bang different chick in each act: check. Kill lots of Communists or Communist-proxies awesomely: check. 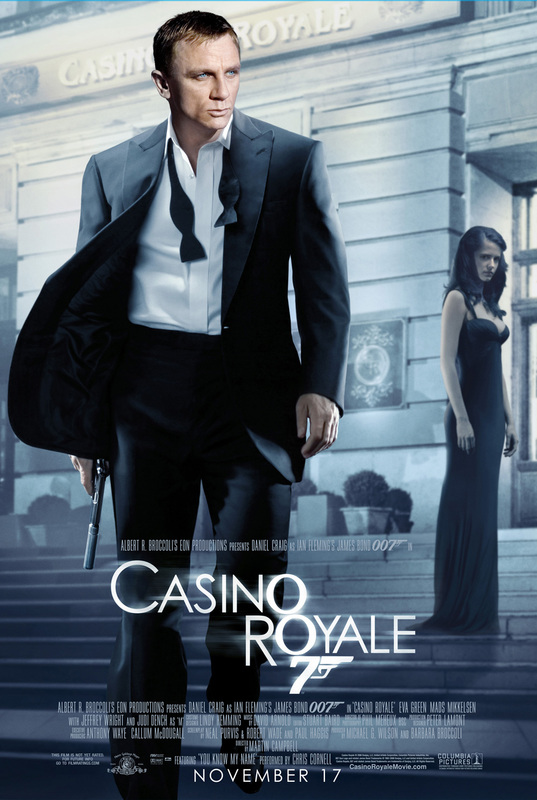 Giving Casino Royale a fair shot, then, was a direct result of its marketing and construction as a brand relaunch, as close as James Bond was ever going to get to an origin story (Hollywood was all over blockbuster origin stories in the middle of the last decade, and still is). And, indeed, much of the superfluous fat was trimmed quite effectively. Really, Casino Royale works best when it’s least like the Bond we’ve come to know from the increasingly inane action extravaganzas; it even strips away previous franchise mainstays like the aforementioned Q and Moneypenny (who stay away until the most recent Craig-era episode, Skyfall). Mind you, this 007 perhaps much closer to the James Bond that Ian Fleming laid out in his novels (and the plot does indeed mine Fleming’s initial Bond novel for plot and character detail): a ruthless android killer with misogyny, addiction, and masochism running in his veins. Daniel Craig is perfect for this sort of Bond, with his deep-frozen blue eyes and stiff manner broken only occasionally by a smile that comes off as almost cruel. The attempts to humanize him (mostly through his genuine-seeming romance with Vesper Lynd, who in the able hands and stunning form of Eva Green is almost too good to be a mere, inherently disposable Bond Girl) are necessary for the liberal-humanist time, but I’d almost prefer they were more honest and just let him be the murdering spy machine (which director Martin Campbell mostly does). There’s even a sort-of reversal of the famous swimsuit-clad moment of female objectification from Dr. No featuring Ursula Andress, with Craig’s rippling, wet physique shown off gratuitously on a beach. Bond-ology aside, only parts of the film worked particularly. The ice-cold opening sequence was a welcome change from the overwrought action set-pieces that traditionally tend to open Bond films, a film-noir treatment from its black-and-white cinematography to the deeply nihilist core. Furthermore, none of the action sequences that crop up with regularity in the film match the sheer exhilaration of the first extended one, an amazing, superhuman white-knuckle foot-chase through a Madagascar construction site that proffers more badass action beats than even a Peter Jackson movie. But then I found the poker scenes to be tedious (I have little time for gambling, not even its supposed psychological underpinnings), the torture scene bizarre (herein lies the hints of Bond’s masochism), and the climax in a drowning building in Venice far too hard-working and entirely predictable. Still, this film adds up to a watchable and often entertaining James Bond adventure, and in the years leading up to Casino Royale, when was the last time a discerning filmgoer could honestly say that? A step in the right direction for a franchise that, whatever one might think of its underlying politics or its uneven aesthetic value, is undeniably a cultural artifact of no small popular significance.